What better way to spend a weekend afternoon than gathered with friends around the fire and two very British institutions - afternoon tea and beer. Smell the woodsmoke, taste the delicious home-made fayre and wash down with some of the very best flavours beer has to offer. The findings of a pan-European quiz* released today by Friends of Glass show that despite beer reminding us of home more than any other drink, the British are more likely to sit down with a glass of red wine on a Friday night. “There is so much snobbery around beer being served with food and so it’s an uphill battle trying to convince people to drink beer with food rather than wine. However, you only have to take a look around pubs, bars and shops to see the artisan and craft ales that are now on offer, and which are so much better at pairing with food than wine". “What’s more, beer doesn’t have to be served in pint glasses. There are plenty of styles of beer suited for fine dining and which are perfectly suited to champagne flutes and wine glasses. 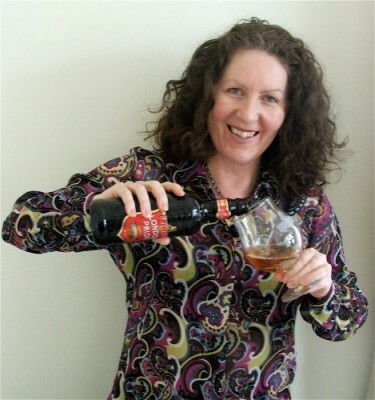 At a beer tasting for Friends of Glass, Jane paired a selection of beers to accompany a cosy afternoon tea. “Many venues serve afternoon tea with a glass of champagne but beer is much better for a number of reasons such as a huge variety of flavours that enhance food and the diversity of styles that means the sweet dishes have a match too . Beer is Britain’s national drink so what better excuse than to indulge and combine the best of British - beer and afternoon tea!” adds Jane. Why not enjoy a similar menu with friends around the fireside this autumn or winter and try some of the beer suggestions from Friends of Glass. This is an aromatic beer with tangy citrus aroma and a juicy grapefruit bitterness. Bitterness prompts the digestive system into action - that's why people often drink Campari or Gin & Tonic as an aperitif – both are bitter. Beer pairing: Wheat beer. Wheat beer is possibly the most versatile of all beers with food. It has a creamy mouthfeel, aromas of banana and clove and a gentle citrus tang. Sometimes it is hard to explain why a certain beer goes with a particular food and this is one of those cases! Beer pairing: Oak Aged Beer. This beer has an intense vanilla oak and marmalade aroma and flavour. Some people taste whisky on the palate. Smoked fish matches well with oak flavours. Beer pairing: Wheat beer. Wheat beer has a creamy mouthfeel, aromas of banana and clove and a gentle citrus tang. Chicken is a delicately flavoured meat and so it needs a beer that will not overwhelm it – wheat beer fits the bill. Beer pairing: Wheat beer. Wheat beer has a creamy mouthfeel, aromas of banana and clove and a gentle citrus tang. All egg dishes match brilliantly with wheat beer! Beer pairing: Porter Pair. Porter has chocolate, coffee, dried fruit aroma and flavour. This style of beer is delicious and versatile with puddings. Beer pairing: Sour ale. It has a sweet & tangy fruity character that matches the tart but with enough acidity to be refreshing and not sickly. Beer pairing : Oak Aged Beer. The intense vanilla aroma and flavour from the oak is a perfect match for the vanilla in this pudding. Beer pairing : Sour ale. It has a tangy fruit flavour and the acidity of the beer cuts through the fattiness of the cream and refreshes the mouth. * Over 29,000 people from 30 European countries took part in the quiz designed to find out about taste preferences and how these are affected by where we live. The quiz, which ran over a six month period on social media, was organised by Friends of Glass.